The influx of people into the cryptocurrency market has made an astronomical rise in the adoption of blockchain technology. Numerous supporters, investors from different field of professions and businesses around the world have embraced new technological innovation which has helped reshape the world. Basically the rise of cryptocurrency and subsequent attention brought to blockchain technology has prompted nearly every industry to evaluate the benefits of integrating the technology into their operations One firm at the forefront of this innovation is OPP Open WiFi a community driven service with the sole purpose of creating a global, free to access open WiFi hotspot network and rewarding each contributor for being a part of our cause. And they are recruiting 25 million WiFi Hotspot Hosts with a view of becoming the largest guest WiFi community in the world. 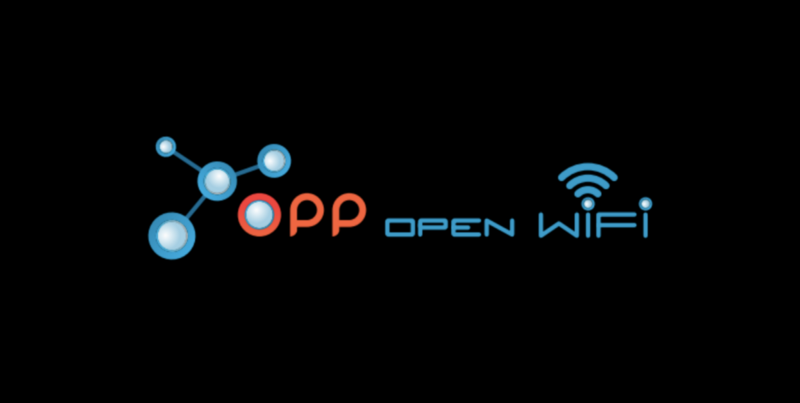 OPP Open WiFi is the simplicity and clarity of business models. Many commented on how expensive contracts and access to Smartphone internet in their country. OPPs can put money back into their pockets, Open WiFi OPP will take obstacles that prevent people from getting web access every day. OPP Open WiFi gives them the choice of internet providers in their country. Paid to share is a strong idea that this business is destined for great success. Many Open WiFi OPPs will reach mass adoption and introduce crypto to tens of millions of people. Uber, Airbnb, and even Facebook. By using smart contracts, every host will be given a certain activity, he will get his reward right after he completed his activity. In secondary contract, hosts will see messages from advertisers for earning OPP Tokens and advertisers will put up push messages. 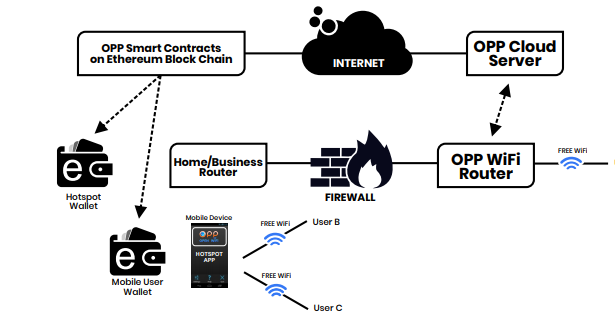 Every transaction will be processed through Escrow smart contracts and every data will be secured in OPP cloud server. OPP have created a cryptocurrency token with which they will pay their WiFi Hotspot Hosts, this token can be used to make purchases on Amazon or be converted into Pounds, Euros or USD. OPP community can exchange tokens from their dashboard and use the value in a number of ways. Each time a member exchanges tokens OPP will make a commission on the transaction. Each OPP Hotspot host will select the number and frequency of advertising messages they wish to receive. These messages will take the form of “push notifications”. Hotspot users will also see advertising messages as they log on the hotspot. OPP advertisers will be billed for each push notification that they send and for each banner advert that is shown to hotspot users. In order to become a Hotspot Host you need to register and then download our mobile app or request a home / business router from our website. The first 100,000 routers will be provided completely free of charge. You decide how much data you wish to donate. Our app will activate the mobile hotspot function on your smart device and “OPP OPEN WIFI” will be seen by guest Users wishing to access the web. The system is totally secure for both the Hotspot Host and the guest user. The system is designed to work with home and business WiFi too. You only need to make your Hotspot active for 1 hour per day to qualify for payment. We will pay you for each device that you use to contribute to the Global Network. We aim to pay you enough to cover all or part of the costs of your internet supplier and mobile phone supplier. If you want to make a little more, no problem. We pay you for reading messages from chosen sponsors. You tell us how many messages you are happy to receive each day and we pay for you for each one you read. If you join our referral program we will also pay you for sharing our media messages amongst your followers and friends. Everyday that you share your data, view a sponsored message or share a post, etc, you will see OPP Tokens being added to your account. Please see our White Paper for a detailed explanation. ICO/ITO are a new way for business to raise funds. Our aim will be to raise $40 Million from token sale and ITO (initial token offering). These funds will be used to buy the hardware, develop the technology, support our stakeholders, fund our day to day operations, marketing and staffing so that we can build a network of 1 million Hosted WiFi Hotspots within 12 months of going live and 25 million within 4 years. Please see the White Paper for a detailed explanation. At the token sale, there will be 142 million tokens for Founders and Investors available at discounts ranging from 50% to 10% depending on how early the token purchase is made. The sale of OPP tokens will include a bonus structure that incentivizes early participants, starting with pre-sale investors.